Allah directs people to the right way; His Management proceeds and reaches the zenith of perfection without ever consulting anyone; to Him all Perfection is attributed. His Wisdom is the greatest, His All-Awareness is the most perfect; His Judgment heads for correctness and sublimity. He guides all His creatures, and directs them to the righteous way, to their bliss in this world and in the hereafter. In the Arabic language the word rushd means reason, rationality, and sound judgment, “..if then you find sound judgment in them,release their property to them” (NISAA’, 6),“We bestowed aforetime on Abraham his rectitude of conduct, andwell were We acquainted with him” (ANBIYA’, 51). Allah, AL-RASHEED, guides and leads to the truth, He says, “..but he whom God leaves to stray, for him wilt thou find no protector to lead him to the Right Way” (KAHF, 17). 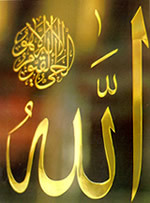 Glory be to Allah, the DIRECTOR to the Right Way, wherewe find our good and bliss, Praise and Glory be to Him, He is Allah.